If you know your cat has ingested something she shouldn’t have, call us immediately at 604-929-1863. If your cat has been profusely vomiting, writhing in pain, and generally miserable the first thing your veterinarian will do is provide intravenous fluids and pain control. In addition, inducing vomiting may allow the cat to rid herself of the object. 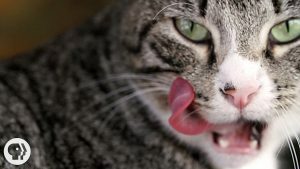 You should never induce vomiting on your own, without talking to your vet first; under the wrong circumstances, it could injure or even kill your cat. The object also may be removed through endoscopy, in which case a long tube is inserted through the mouth of your cat and is used to pull the object from the stomach. Your veterinarian will make recommendations, and if this is the case, may also suggest hospitalization of your kitty for close observation and follow-up x-rays to track the progress of the item. If you’re not sure, ask us, Parkgate Animal Hospital (604-929-1863). We will be your best resource in determining which toys and objects are safe for your cat and can also give you advice on how to prevent your cat from eating strange objects.